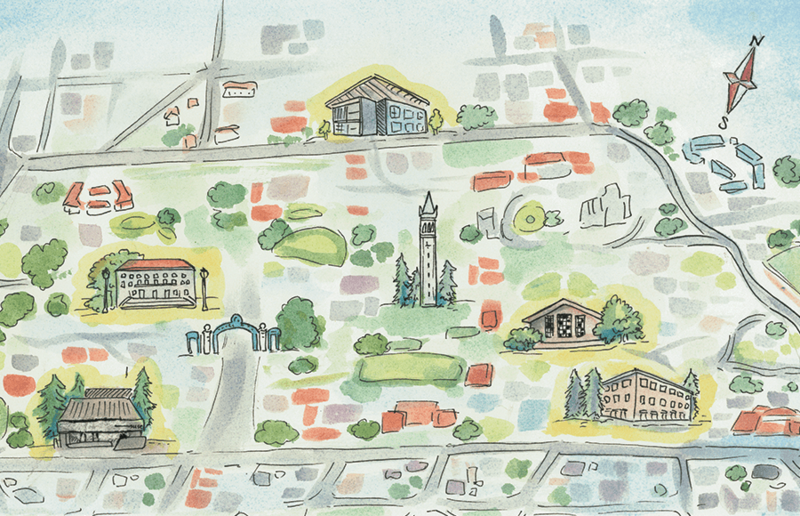 College campuses may as well be the Minotaur’s labyrinth, and UC Berkeley is no exception. Parents, prospective students, freshmen and seniors alike wander aimlessly, having absolutely no idea which way is left, right, up or down. Have you ever thought you’re walking from Doe Library to South Hall but somehow end up at the east end of or in Strawberry Creek? Read on, friends, to learn how to navigate campus. Probably the first thing that comes to mind for bearings is the first thing you see when you enter campus (from Hearst Avenue, at least), the Holy Grail of the moment: a campus map. We highly suggest you, well, use it. We hope you have good memory though, because this map won’t stick around all the way across campus. Your phone is your best friend. Now it’s time to make these map apps your best friend. They seriously work, despite all the bad stigma from yesteryear. We’ve sworn by them since we first stepped foot on campus and for the world beyond. We get lost easily — don’t judge. It may be hard to muster up the courage to just go up to someone and ask them, “Where am I?” but if you ever want to make it home safely and not be walking sadly around campus forever, you should. It’ll be good for you and your social skills. UC Berkeley’s campus has a myriad of trees for you to climb. They aren’t very tall, but they’ll get you somewhere, hopefully in a more right direction than you were before. Just climb one every so often, and you’ll be good. It’s tall, it’s pointy, it’s beige/white/ivory and rings every so often. It can be seen from almost all parts of campus. Let the Campanile be your North Star; it’ll tell you if you’ve gone too far, too much to the side or if you’ve been going the wrong way altogether. Some say if you stare up at it long enough, your neck will start hurting. How magical. Don’t let your horrible sense of direction get you down. We know the struggle of not knowing where we’re going all too well (and that’s not just on campus). Guess we can’t all be whales with their built-in GPS, but we can use these other things to help us get by!